You’ve got something important to say. We all do. And it doesn’t matter if you work in education, advertising, sales or a local coffee shop; you just want to make sure your message isn’t falling on deaf ears. The trick to communicating a successful message is not to place all the emphasis on what you’re saying. The real trick is to understand how your message is being perceived. However, very few people, teachers, companies, and organizations understand the importance of communicating in a brain-friendly manner. Recent neuromarketing research conducted by NeuroFocus, the world’s leading neuromarketing firm, has shed light on the startling gap created by a lack of brain-friendly design in today’s society. “We have found that about 75% of all content – not just advertisements — is not neurologically optimal,” Pradeep, CEO of NeuroFocus added. “The opportunity to improve is tremendous.” I could not agree more with Dr. Pradeep’s stance on seeking to improve the content and delivery of our messages. We spend a lot of time crafting our messages to get them out to our audiences. When our messages aren’t understood we normally do two things. The first thing we do is repeat our message and if that doesn’t work we amplify our message. That’s the equivalent of me speaking gibberish, repeating my gibberish, and finally screaming my gibberish at the top of my lungs in hopes that you somehow get what I’m talking about. It sounds pretty crazy huh? Neuroscience has provided us with some great tips that can make your message and your delivery more efficient so you’re not wasting time and money. I could have easily titled this article “How to Create Neurologically Optimal Designs”, but that’s too much work for most people’s brains to process, especially if you’re not familiar with neuroscience. Most marketers make the mistake that their audience is just as familiar with their goods and services as they are. Break that knowledge bubble and begin to understand how your audience perceives not just your company, but your industry. Then you can begin to craft a consistently simple yet relevant message that could be absorbed with greater ease. Remember that we have three main areas of the brain. The neo-cortex of the brain is the area that allows us to think in great depth and possibility about an idea or a message, but the part of the brain (reptilian brain) that decides to act on that idea relies heavily on emotion and simplicity. This may include simplifying your offering as well. If you present people with two choices you have a much better chance at getting your desired outcome than if you presented someone with three choices or more. Boil your message down and perfect it. Avoid the marketing/sales mistake of “showing up and throwing up”. You’re offering may be bountiful, but sometimes showing all that you offer can turn off or overwhelm your customer who often times is only looking for one thing. Start with your customer’s most urgent and immediate need, present to it, solve it, and then move onto to their next important need. This is for those graphic designers out there. With an infinite amount of fonts in your design arsenals you should know the power your font can actually carry. When people read something in a difficult-to-read font they unwittingly transfer that sense of difficulty onto the topic they’re reading about [Drake Bennett, Easy = True, 2010]. This has been proven in studies where participants were asked to rate the difficulty of a workout regiment. The regiment typed in less legible font was perceived as more difficult compared to the same regiment typed in a simpler font. Surprisingly, a questionnaire presented in a less legible font is more likely to have people answer it less honestly that if it is written in a more legible one. My best advice is to decide the goal of your presentation or advertisement. Do you want to grab someone’s attention or do you want to pass along information? Knowing the overall desired outcome allows you to become more attuned to the font you choose. For example, if you’re presenting to parents and teachers on a 5 step process for getting children to eat healthier you had best pick a font in your handouts that easy to read, and I’m not talking about “Comic Sans”. I can’t express the importance of contextual advertising. The best product placement advertisements are the ones that people never meant to happen. Think about the Air Jordan basketball shoes. 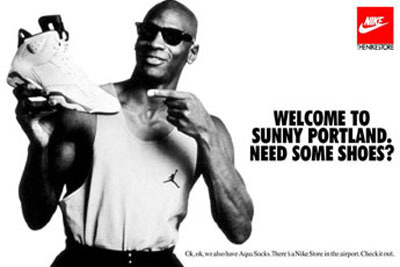 How many of us watched Michael Jordan play, noticed the shoes he’s wearing, saw how good he played and went out and bought a pair? I know I did. It’s one thing to show a picture of your products. It’s another thing to show your products in actual use. If I look at a picture of a product, it’s just a product in my mind. If I see the product in use I see an experience, and I have my own experiences that I can relate it to. People interpret information on different parts of a screen with different sections of their brains. 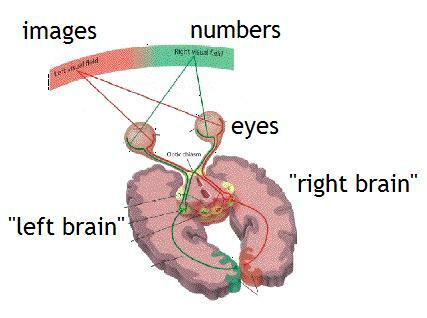 Stimuli in the left visual field are interpreted with by the right frontal lobe, while stimuli on the right are picked up by the left frontal lobe [Kee. 2008]. What does this mean? The right (creative) side of your brain is very good at interpreting imagery, whereas the left (analytical) side of your brain is particularly good at processing numerical information and semantics. You see with your brain. Not with your eyes. As you can see here your visual pathways cross as they relay the stimuli they're perceiving back to the brain. Logos and pictures would stand a better chance of being perceived if placed on the left side of advertisements. Statistical information and financial projections would best served on the right side of the screen for presentations. This is a simple yet powerful fact in brain-friendly design. Don’t just make people think. Make them Feel. Emotion helps you gain attention. Emotion helps you learn with greater ease. Emotion makes you memorable in the mind of your audience. Emotion can take many forms and can be a powerful aid so long as it’s relevant with your message: tell a story, crack a joke, create a mini-drama or even use a prop, but whatever you do avoid the norm. Understand that attention and retention is strongest at the beginning and end of your message. So leverage your emotions properly. John Medina, author of Brain Rules, became an award winning professor because of his work in neuromolecular biology and his understanding of how to properly apply emotion into his lessons. The passing of knowledge doesn’t have to be tasking. Science backs up the fact that people learn and retain more when they’re emotionally engaged. John’s solution was to break a 50 minute class period up by 10 minute increments using an emotional tactics like jokes, stories and role-play. The emotional pace of the class was enjoyable and his students succeeded because they were engaged. Makes you think twice about giving the same old power point doesn’t it? These are only just a few tips on improving your visual presentation of your ideas and messages. Hopefully as you’re sitting at your desk, in your office, or at your computer you’ll get a chance to practice some of these tips. The importance in communication should not be placed on what you’re saying, but rather how your message is being perceived. It’s not the market place, the media, or the internet; what matters most is where you are at in the mind of your audience. Be different, be memorable, and above all be genuine. Best of luck to you and thank you for reading. A little over a month ago I was driving down I-55 heading back home after a meeting in downtown Chicago when I saw something that almost caused me to crash my car. I saw a billboard that was red in color and featured tacos as its centerpiece. As I got closer to the billboard I realized that it was Chipotle’s new marketing campaign. I was heart broken, I was devastated, and most of all I was confused. Why had Chipotle done away with their highly successful and recognizable marketing campaign for this red colored disaster? this sign nearly caused me to crash my car. who are you? I’ll start by saying that I have a profound respect for all things Chipotle. Aside from working with them on a national level for their in-store operations I had extensively researched Chipotle for my marketing classes in college. I love Chipotle from their delicious burritos all the way to their unique marketing style. I was quick to notice the change in their advertisements, but what I had also noticed is that the people around me noticed the change as well, and they weren’t too happy about it. Chipotle does not advertise in mainstream media. They do not run nationally televised commercials and they reluctantly dabble in radio spots. They don’t have to because Chipotle does hundreds of millions dollar in business each year without foolishly wasting money on mainstream media advertising. Chipotle’s marketing is so simple it is genius. They rely on word of mouth, free burritos, and billboard advertisements that truly stand out. Neuromarketing studies of branding have shown that the most powerful aspects of advertisements aren’t logos as previously thought, but rather they are the environmental design aspects of an ad. That is to say people respond more favorably to consistent design than a Logo. For example when I showed people just the confidential type font and asked them what it reminded them of over 85% said Chipotle. That was just the font. When I showed them a picture of the foil wrapped Burrito an even greater percentage knew it was synonymous with Chipotle. The truth is that Chipotle’s Marketing is so strong and recognizable they could completely remove their Logo from their advertisements and people would still know its Chipotle. Marin Lindstrom, author of Buyology, calls this marketing phenomenon “Breakable” meaning that if I were to take a Chipotle billboard and break it into pieces you could look at the pieces and still recognize it as Chipotle. That’s some pretty strong marketing. The interesting thing is that Chipotle has been tinkering with their logo over time (you probably didn’t even notice), and they’ve been able to get away with it because their marketing design hasn’t changed that much, until now. These are various logos that Chipotle has used in chronological order. Breakable Marketing: Here is another prime example of a brand that relies on it's design more than it's logo. The Burberry logo (on left) is weak in terms of neuromarketing compared to the classic Burberry plaid design. This plaid design is versatile and can be woven into the fabric of the clothes to create a concrete perception that moves beyond logos. Break the plaid design into pieces and you've still got something that is recognizably Buberry. Here is a side by side comparison of Chipotle’s advertisements. The one of the left holds a heavy neuromarketing presence in your brain: The recognizable font, the focus on Chipotle’s core product – the burrito, and the stand out simplicity. The advertisement on the left features tacos – something that Chipotle offers but not its specialty. The font is boring and non-recognizable because hundreds of companies use that font in their advertising and the same can be said for the deep red color and text bubble design. Although both adds are emotionally appealing because of the witty phrase content the traditional marketing ad is just designed better to stick. Three weeks after I had first spotted the new Chipotle advertisement on I-55 it was gone. In its place was Chipotle’s traditional marketing advertisement that we all know and love. I guess Chipotle was wise to the fact people weren’t too happy with the change. I did notice that the traditional billboard featured a new Chipotle logo, but I was okay with that because the design was the same as in the past. A nearly perfect marketing campaign was restored to its former glory. Our brains love consistency and recognition. Chipotle’s traditional marketing has both. As marketers we are highly creative and sometimes we think we need change when we actually do not. This was a classic case of “if it ain’t broke, don’t fix it.” However, in this failed attempt at change we were able to discover that you can change and evolve a logo of a successful brand so long as you don’t overhaul the design of the marketing itself. Neuromarketing was right this time around in pointing out that our perception is keener to consistent marketing design rather than a single logo. Good luck Chipotle and keep up the great work!